Jessie Zero Suit Samus (SJS) by jetfantastic with credit to CSBR's CSProject for cosmetics, Ryztiq, jiang, Pik, StarWaffle, Albafika, KingJigglypuff, SJS, Nanobuds, Spex130, TʘCK and Sandfall for SJS Zero Suit Samus. A recolour for the SJS Light Suit based on Jessie from Team Rocket. Includes CSProject assets for CSP, BP and Stock Icon. Juliet (Female Lasercraft32) [SSB CLRS] by Lasercraft32 with credit to Lunoz, for the oringinal model. And Cal242, for requesting I post this at all! Juliet, The Neon Jewel. Lasercraft32's alternate dimension self! Has metal materials, haven't tested it, but it should work. If there are any issues, PM me! PM me if you like these mods if you want so I can know what's up! - also, the eyes have a final smash glow instead of using a glow map. Here are a few Purple Heart recolors I made for BlackJax96's import. It has an Adult Neptune alternate which changes the face and hair to be like Adult Neptune from Megadimension Neptunia VII and includes Purple Heart's recolors too, a new recolor from the rebirth games that wasnt included in the original mod and an alt based on Zero Suit Samus. I also lowered the texture resolutions for hopefully less lag overall. If you experience any issues with this mod, please PM me. Bailey just got new weaponry! Straight from TE, the only new difference is that the left arm is a BIG cannon! 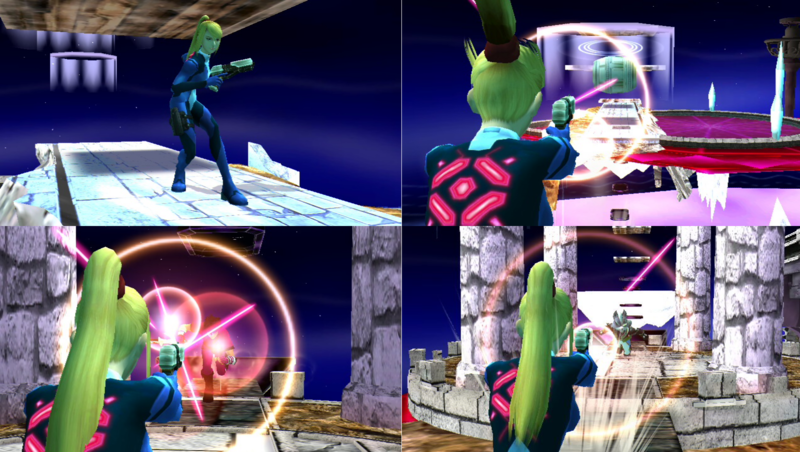 The cannon is from Smash 3's Samus, which is the Smash 4/Other M Samus model. Wi-Fi safe, has CSP Cosmetics, no extra recolors. Includes CS Project pose cosmetics and cosmetics using my own pose. If you experience any issues with the mod, please PM me. Here are some recolors I've made for DSX8's Black Heart import over ZSS. It contains a Noire Recolor which modifies the face and hair to be more like Noire along with Black Hearts original recolors, a recolor based on artwork by the game artist: tsunako, and a custom recolor based on Zero Suit Samus. I also lowered the texture resolutions for less lag during gameplay. Hi! I just got the textures directly from the wii u. The hair is from the trophy model because the fighter model is grayscale. The bikini alts had a makeover too! This pack includes brawlified versions of some of AzLx's ZSS mods as I felt that the skins were a bit oversaturated, a brawlified version, more accurate version of a Tifa recolor and a new two piece swimsuit ZSS which is an edit of my previous swimsuit mod. Includes Legacy TE Cosmetics and Smash 4 Cosmetics. Exactly as stated in the title as this is for those who prefer Brawl's ZSS over the SJS one. With this and the JB 3.5 personal update, all of the 3.5 alts are now able for a still Brawl style replacement, plus three more alts to go along with them for an easily planned 20 costumes build (whenever or whoever finishes that code first.) for Brawl Zero Suit Samus. If there's any problems, let me know. Forgot some BPs on the last release of this, sorry for the inconvenience. Remember when Program updated Brawl ZSS with an actual spec map and lights? (http://forums.kc-mm.com/Gallery/BrawlView.php?Number=209005) Well I wanted to apply Moe's Brawl recolors (http://forums.kc-mm.com/Gallery/BrawlView.php?Number=213240) to these whilst making new Specs for the recolors. With JB, I put the mats on the original 3.5 version of the body since Program's JB breast had some problems that you could see: https://i.imgur.com/ePorKvj.png. But that wasn't it for JB, who has been given SJS JB's Boots as well as my SJS gun arm to wrist armor edit. Then I used either Moe's or edited Moe's recolors (http://forums.kc-mm.com/Gallery/BrawlView.php?Number=213157) to this updated version of 3.5 JB. \"I am Samus. Samus Aran, the most powerful bounty hunter in the universe. That prize for placing atop the rankings in Smash has to be substantial for there to be so many competitors. It better be worth the time and effort I'm putting into this. Hopefully, I can take out some of those crooks that have slipped into Smash too before they start trying to wreak havoc. After some specialized training on my own, I have returned to the battlefield with a faster and more agile body. Though I've also come prepared with some upgraded gear, I don't believe my Power Suits will be needed all too much considering the improvements I've made. Some of these people don't even seem fit for fighting. Of all things, there's a walking drawing and an astronaut with anthropomorphic flowers at his side. Nevertheless, I've been through too much to go around underestimating a potential adversary. I will demonstrate the true power of the Chozo. Smash is mine to win, and mine to lose.\"
(NOTES: I included my minimally-edited Power Suit Samus PSA and skins just for consistency with Zero Suit Samus's parts textures upon entry and FS transformation. They're nothing special. 95% of this is all about ZS Samus. Just one glitch: There's a very slight chance that you may load up a stage that interferes with her texturing and makes it so that either her body flickers, or only her head is visible. I'm not sure if it's because of the model's rim lighting or whatever else, but it can be a little annoying regardless. I'm not sure how to fix that, but considering how harmless it is and because I really don't like vBrawl's model of her, and since this is such an improvement over vBrawl, especially for a custom build (A+ material to the original creators!! ), I'm sticking with this one. Just don't be too surprised if her body starts twitching or turns pitch black and you have a head on top of a moving stick of blackness. Default Varia Suit over Samus is vBrawl's. This was a Custom ZSS commissioned by SU | Fearless for Tram Tram of TTeP. It was based off of the original Yellow Ranger Design from the Mighty Morphin Power Rangers. this version of Bayonetta is from Smash for 3DS, it comes with all 4 colors of the Bayonetta 2 outfit. This is jaystring's Smash Wii U ZSS import with the textures adjusted to look more like smash 4 ZSS. Credit to jaystring for the original model and textures, Smash 3 Team for Smash 3 Samus used in a preview image. Juliet Starling ZSS by AzLx with credit to Jaystring, p0rogami. Fierce Deity ZSS by AzLx with credit to Jaystring, p0rogami. Nina Williams Samus by AzLx with credit to Jaystring, p0rogami. comes with CSP and BP. 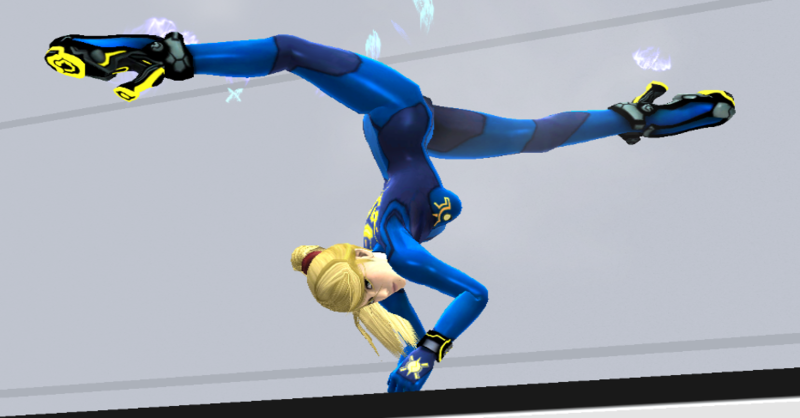 this is a spiderman recolor for zss with the Jaystring´s zss model. Enjoy. Hilda Suit Samus (Pokemon Black and White) - Smash 4 by AzLx with credit to Jaystring, p0rogami. 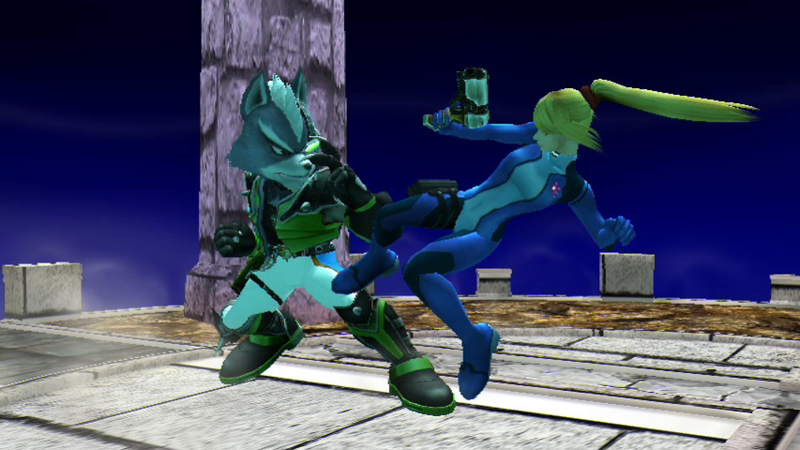 I have improved the movements of ZSS being more as similar as possible to Smash4, in the pack are the textures with which I work so that you do not have any problem when trying this mod. 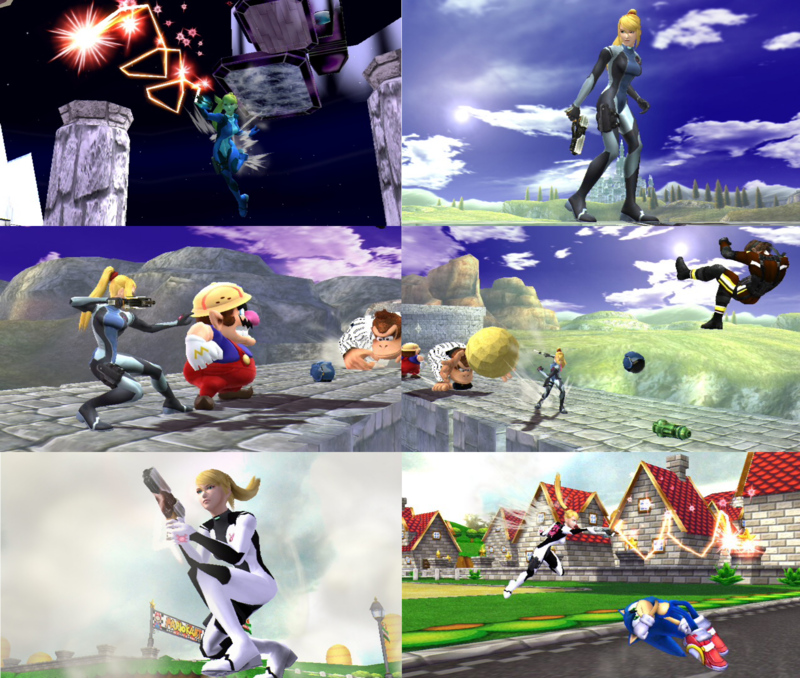 everything changed, all animations were improved to be similar to ZSS Smash4 ... Enjoy! Page created in 0.629 seconds with 136 queries.